What if our smart assistant is more responsive and personalized to our needs and interests? Currently, people do not use voice assistant to its full extent due to user’s lack of sentimental attachment and motivation to use an assistant, and limited personalization of an assistant. Interactions with voice assistant already out in market are very mechanical, unnatural and task-oriented though voice itself is very humane and organic channel of communication. Our team thought that users could be more motivated to use our smart assistants if these smart assistants are more responsive and personalized to our needs and interests. Also, these personalized assistant can enrich our experiences with voice assistant far beyond. #1 Diary study: How do we use voice assistants? In order to understand how current voice assistants are used, we individually used voice assistants (Google Assistant and Siri) for a week and logged our experience in a diary. We found when we are motivated to use voice assistant and discovered that our interaction with the voice assistant feels very mechanical. It is often used as alternative keyboard and has limited opportunities for personalization. #2 Contextual Inquiry: How do we start a conversation? We conducted three rounds of conversations with strangers to investigate how people talk to each other when they meet for the first time. Then, we had a post-conversation interview to gain insight on when people felt comfortable or awkward and paid particular attention to the colloquial techniques we often overlook that current voice assistants lack. We discovered that there has to be a seamless transition in taking turns between two people, a clear indicator for ending of the conversation, and discovery of a common topic to facilitate a comfortable conversation with a new person. Based on the interview, we drafted a rough script for the initialization process of a more humane and conversational assistant and tested the script with 6 people. Using our drafted script we conducted a role play through the phone as if one was a smart assistant and the other person was a user trying the smart assistant for the first time. We wanted to learn whether our initial scenario effectively conveyed the personalization process and analyze user responses to the proposed assistant experiences. From testing, we learned that we should refine our scenario by setting clearer expectations to the user about the onboarding process. Also, we discovered that altering the assistant's voice didn't feel like a natural introduction to the assistant's personalization capabilities, and decided to instead add a visual character to better communicate gestures and feedback. Through the research, we refined the scenario and designed the interface of personalized assistant with these key aspects below. Project Melo is a personal assistant that learns about you through your conversation with it. More things you share with your assistant, more things it can do for you. You can initialize your assistant’s name and appearance through your words. Then, visual character of assistant is generated. It responds you both visually and vocally, as people communicate through non-verbal cue as well as actual words to deliver what they mean. Over the time, assistant learns about you based on how you talk in conversation. Your assistant adapts itself reflecting what it knows about you. This personalization will encourage attachment to your assistant. More things you share more things your assistant can do for you. When people know each other better, they also can give better suggestions for you. According to what your assistant knows about you, it gives you contextualized recommendations that is helpful to your situation. For instance, your personal assistant can analyze your photo album or social media and suggests what you can wear in rainy day instead of plain number to indicate temperature. Your personal assistant can catch cues about your condition and emotional states through the way you talk — nuance, tone, connotation. It analyzes through conversation in the past. 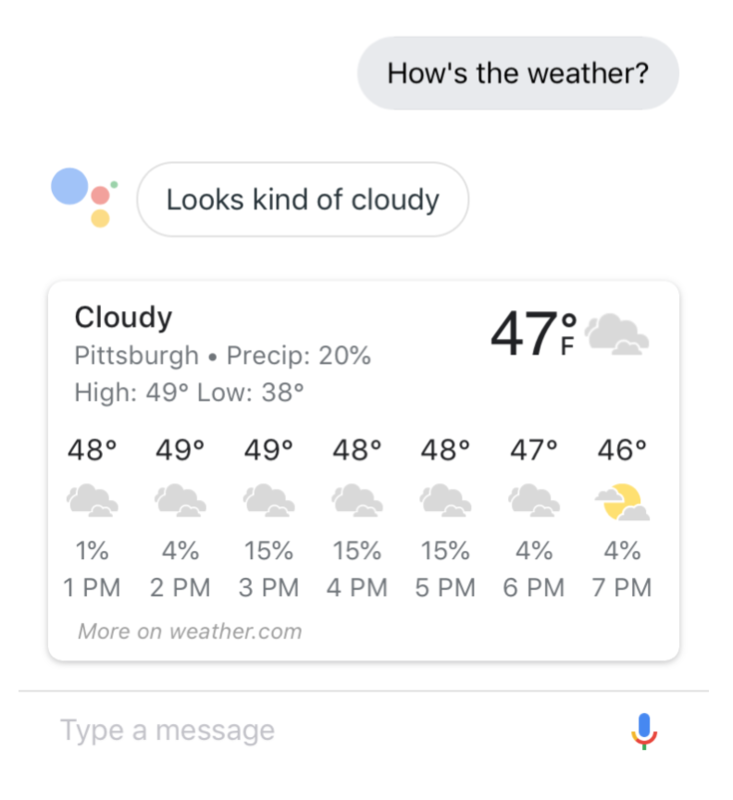 Also, you can manually edit assistant generated text and use button on the down-right “I don’t want to talk about it” when you feel uncomfortable to talk about certain issues. Using the wizard of Oz technique with our high fidelity prototype, we conducted three rounds of testing to evaluate the success of our design. The goal of user testing the initialization process was to verify whether the solution increases interest and motivation for first-time users. To measure the outcome, we instructed each participant to rate features from 1 - 5 after going through the entire initialization process with Think Aloud method.